Legislative Day!! Tuesday, April 9, 2019!!! Legislative Day!! 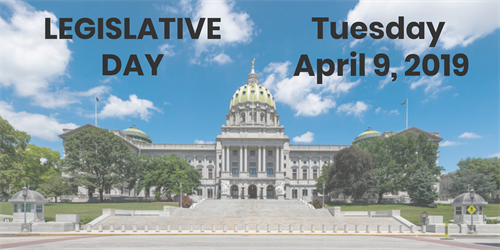 The Pennsylvania Pharmacists Association is hosting its annual Pharmacy Legislative Day at the state Capitol in Harrisburg, PA, on Tuesday, April 9, 2019. Attend and talk with your legislator in a face-to-face meeting. This is a great way to educate legislators about the important issues facing pharmacy today. Help the PPA’s legislative team advocate for pharmacy issues and the patients you serve. CLICK HERE TO WATCH THE RALLY! CLICK HERE TO SEE THE PHOTOS FROM LEGISLATIVE DAY 2019! This year PPA was able to book large group tours for 9:00 AM and 1:30 PM. Please go to the visitors desk in the main rotunda 10 minutes prior to the tour time and let them know you are with the PPA scheduled tour. If you're unable to make it for either of the group tours you can still see what President Theodore Roosevelt called "the handsomest building" he ever saw. Tour guides offer tours every half hour from 8:30 AM - 4:00 PM. Simply go to the Visitors Desk in the Main Capitol Rotunda to explore joining a tour. PPA will schedule all legislative appointments. We will place students and pharmacists together for one group legislative meeting. Please Carefully Note: Be sure to check both lists for your appointment times and locations and write them down. PPA will not be able to tell you the time or location of your meetings on the day of Legislative Day. Click on the links below for information on the issues and topics that we will be advocating during Legislative Day. PPA has a limited number of rooms blocked at the Crowne Plaza Harrisburg for the night of Monday, April 8, 2019. Click here to reserve today or call 717-234-5021 using block code PPA. Attendees will receive one attendee packet upon arrival that will include all of the information you need to know about the issues including bill numbers, sponsors, and legislator committee assignments. The packets will also contain meeting feedback reporting sheets. Please complete a report on each of your legislative visits. You also will receive a legislator leave-behind packet for each meeting you attend. We will have one leave behind packet for each legislator. If you are going to a meeting as part of a group – please designate one person to be in charge of getting the leave behind from the registration desk. The legislator packet will contain Issue Briefs and other information. The packet is to be left behind for each legislator after your meeting. You are responsible for taking note of the times and locations of your meetings. PPA will not have that information available the day of Legislative Day. Please put the times in your calendar or write them down. Parkmobil app – Get the parking app and easily pay and add additional time to your meter from the convenience of your phone.